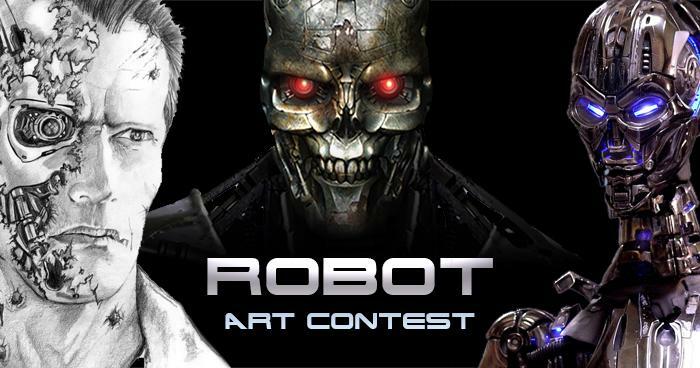 Welcome to the Stan Winston School of Character Arts Robot Art Contest! To enter this contest simply post a new discussion in the "ROBOT ART CONTEST" category. Please include a description and high rez pictures of your robot artwork. Video submissions are cool, too! Just upload your video to YouTube and share the link in your post. We'll consider robot art of ALL KINDS, including drawings, paintings, digital designs, sculptures, puppets, and even full-size costumes. The only requirement is that the submission is your original artwork. Do you make lots of robots? Not a problem! You can submit as many as 3 entries to the contest. So share your mechanical creations and you could win the Grand Prize! All contest participants will receive a special promo code for 20% Off Stan Winston School webcourses, DVDS & Merch! Your submission will be reviewed by the team here at the Stan Winston School of Character Arts and judged based on quality of work. Prior to judging you can update or remove your entries as often as you like. Once the contest has ended our judges will review all submissions and the winner will be announced. To be considered for the contest, all entries must be posted by July 31st, 2015. We will select and announce the winning Robot Artist on August 7th, 2015! 4. CONTEST ENTRY: All submissions must be the ORIGINAL WORK of the contest entrant, and received by the date and time outlined on the Website(s). For purposes of these Official Rules, “receipt” of Entry occurs when Sponsor’s servers record the Entry information resulting from contestants’ entry being posted in the SWSCA ROBOT ART CONTEST forum category. Any automated computer receipt (such as one confirming delivery of email) does not constitute proof of actual receipt by Sponsor for purposes of these Official Rules. By entering this contest, you grant SWSCA the irrevocable right to share your submission photos and/or videos on our website, email, and social media channels, copyright is retained by original author. Sponsor reserves the right to disqualify any Entry for any reason, in its sole and absolute discretion. Odds of winning depend upon number of entries received. I might want to try this....im really busy....but I think I can.....thank you chris! I'm new to this site, how do I post a thread? Joshua: I've sent you a private message with instructions on how to post. Just saw this contest..Huge Terminator Fan! I may have to make some stuff for this one!! Cool i'm a huge Terminator Fan! I never thought I'd ever get a chance to win a film used Terminator prop! Awesome idea! SWSCA never runs out of great ideas. Love it! Oh bummer, I'm too late. Oh well, I'll catch the next one? Been real busy lately.